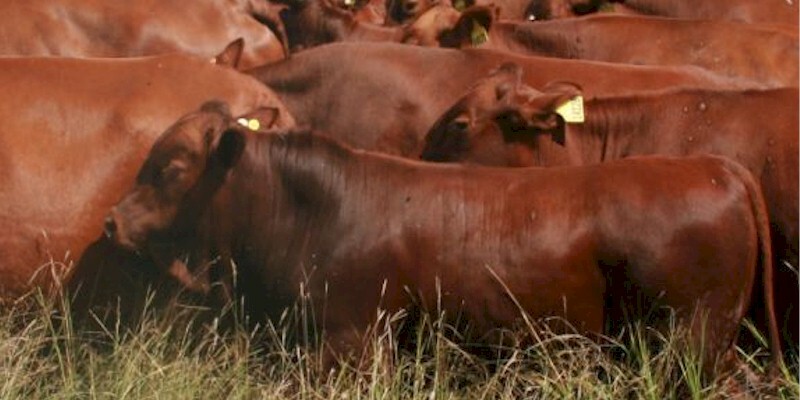 Belmont Red are Australian cattle raised mainly for meat production. They were developed by the CSIRO (Commonwealth Scientific and Industrial Research Organization) during 1954 in response to the need in the Australian Tropics for cattle which would improve the fertility of Bos indicus cattle. And it was released to the Australian cattle breeders by the CSIRO in 1969. They were developed from several Bos Taurus cattle breeds including Africander (African Sanga), Hereford, and Shorthorn. The breed has exhibited higher fertility than pure Bos indicus cattle breeds and better than most other Bos taurus and Bos indicus cross. Along with improved fertility the breed also remain the characteristics of hardiness and heat and tick tolerance. Performance of the breed has been proven in comparison traits on research stations in Africa and Australia. Their good performance and relatively docile nature have been recognized by the Philippines and the Pacific Islands where improvement in livestock population is carefully monitored. Currently they are popular mainly in Australia. They are medium sized and have a good conformation in relation to beefing quality. They are phenotypically and genetically a mix of Bos taurus and Bos indicus. They have a smooth and short haired coat which is predominantly red. Although they may have some white occasionally. They are pretty fast growers and reach maturity as early as about 10-14 months.